We are headed to end times. Rivers will run red with blood and gravity will soon reverse itself. Load up your shotguns, pack up your emergency rations and horde all of the Pogs you can (currency of the future). What we will soon encounter is Y2K times a million. What we will soon encounter is the end of bacon. Feel free to throw out your Y2K survival kits. You will need a LBS2K11 one though. The smartest scientists in all the land know it's inevitable. Food scientists and butchers will still be able to go inside the pig and get all the pork chops, loins, Nutella®, nachos and fake bacon, but no real bacon. It will simply vanish from the pigs and create the large bacon scare of 2011, or LBS2K11, as those people who love acronyms call it. LBS2K11 will bring about truly scary times. 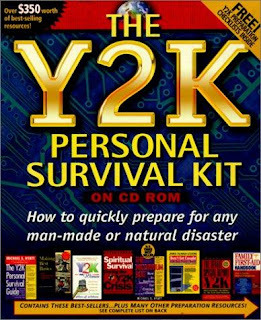 As with Y2K (another one of their acronyms), there will be massive looting, but unlike those days, this will be motivated by something actually occurring. Underground speakeasies will pop up where proprietors offer poor substitutes like alcohol, cocaine, methamphetamine and kelp. But nothing will truly fill this horrendous thirst for bacon. Jacked up on their lack of pork-strip product, people will gain mystical and devastating kosher powers like flight and ability to make a green dot appear on someone's ear. With these powers and the drive of bloodlust, they will turn to cannibalism. This whole situation probably seems pretty strange. People have been slaughtering and baconing pigs for ages. Why would they suddenly forget how to do it? Why would bacon suddenly disappear? Being a tireless researcher, I decided to call up the Hormel corporation, which certainly seems like it would know a thing or two about the world supply of bacon. If something messed up in the bacon supply chain, odds are they'd know about it. I contacted the Hormel corporation at their home in Austin, MN, and had the following conversation with a delightful employee named Francesca. 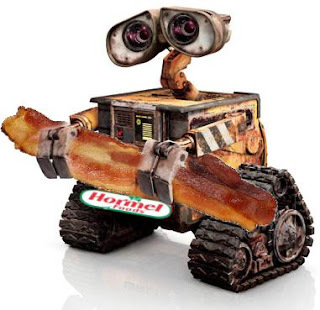 “Hello, you've reached Hormel, future lord and ruler of all the land and keepers of the bacon robots that will decide your destiny. How may I direct your call?” I said. Ha! Proof right there of the bacon-robot apocalypse, confirmed at the source. Ms. Francesca confirmed everything in a mere 26 words and a contraction. Really, it's sad, because bacon is delicious and robots are sweet. To combine them would have been an amazing combination, but when combined for evil, well that's just... that's just evil. Anyone still reading this now probably realizes it's all made up. They realize it, because odds are, they're mainlining bacon into their bloodstream and realize that we therefore cannot be out of bacon. Please do take this as a cautionary tale, you know, one that advises against mainlining bacon. If not for you, do it so our kids can grow up in a world with the miracle product.